The first step was to gain a place in the main draw, the last step was to climb to the top rung of the ladder; at the Seamaster 2018 Hang Seng Hong Kong Open on Sunday 27th May Japan’s Kazuhiro Yoshimura completed both goals. He beat fellow qualifier Korea’s Cho Seungmin in four games (11-5, 5-11, 11-8, 11-3. 11-7) to emerge the somewhat surprise champion and record a milestone win. Very much new territory for both players; notably last year Kazuhiro Yoshimura had been the runner up at the 2017 ITTF Challenge Spanish Open when beaten by India’s Sathiyan Gnanasekaran, whilst also Cho Seungmin had reached the semi-final round at the Seamaster 2017 ITTF World Tour Australian Open. Thus a good start to settle the nerves was no doubt essential, the better start was made by Kazuhiro Yoshimura but Cho Seungmin is a resolute character, he responded to secure the second by the same margin as he had lost the first. Matters level, Kazuhiro Yoshimura responded to win the third game in a very similar manner to that of the first, Cho Seungmin saving two game points before having to concede defeat. A three point lead established, whoever gained that advantage progressed, there were no major recoveries; that situation was even more emphatically underlined in the fourth game. At 3-all it was parity, the stage at which Kazuhiro Yoshimura went from strength to strength as Cho Seungmin became hesitant and Kazuhiro Yoshimura gained in confidence. He did not surrender a further point; eight in a row gave him a three games to one lead. In the fourth game once again Kazuhiro Yoshimura established the valuable three point lead. He led 5-2, Lee Chulseung, the Korean coach on duty called “Time Out”. Kazuhiro Yoshimura secured the next point but the next four went to Cho Seungmin. Maintaining his focus, no hint of panic, Kazuhiro Yoshimura halted the sequence, at 10-6 he held four match points. Cho Seungmin won the next point but no more; the title belonged to Japan. Once again for Cho Seungmin it was the runners up spot. Four days earlier he had been beaten in the final of the Under 21 Men’s Singles event. He had suffered at the hands of Chinese Taipei’s Lin Yun-Ju (11-9, 9-11, 11-6, 11-9); on the concluding day of action he suffered again. Furthermore, just as it was the 21st birthday of Chen Xingtong, the runner up one match earlier in the Women’s Singles final; so it was also the 20th birthday of Cho Seungmin! 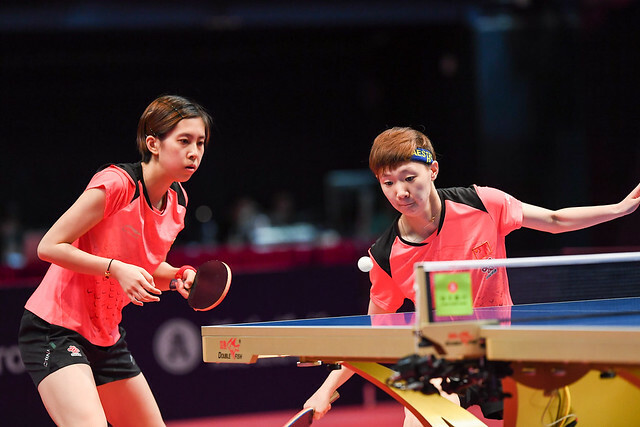 Now that is unique in the history of the ITTF World Tour! Success for Kazuhiro Yoshimura meant family pride was restored, at the quarter-final stage of proceedings, one day earlier Cho Seungmin had beaten, elder brother Mahara Yoshimura (11-7, 11-7, 11-1, 9-11, 10-12, 6-11, 11-5). However, overall, it was a most successful venture for the Yoshimura family. The title for Kazuhiro and a memorable win for elder brother; in the opening round, Maharu Yoshimura had beaten China’s Zhang Jike (11-9, 8-11, 13-11, 13-15, 6-11, 11-8, 11-9). Did elder brother not make things possible for younger brother?